Those darn rice noodles will trip you up if you’re not careful. We’re so used to boiling noodles that when we saw “soak” in the instructions on the back of the rice noodle package, we thought it was a translation error. It wasn’t. Boiling those babies make them stick together like glue. Determined to make pad thai at home, Stacey tried again. She soaked the noodles, but the water wasn’t hot enough, so the noodles were crunchy. Not good. On the third try, she soaked the noodles in hot water from the tap until al dente (yes! ), but then cooked them too long with the ingredients in the pan (no!). So here’s a recipe modified from and inspired by one we saw in Everyday Food Magazine. If you don’t get it right the first time, don’t worry. Try again. And again. And again! Soak rice noodles (eyeball it – make about a cup per person) in hot water until al dente, but not soft. Should be about 8 minutes, give or take. In a bowl, whisk 1 Tbsp. brown sugar, 1 Tbsp. lime juice and 2 Tbsp. soy sauce (adjust quantities to taste). Set aside. On the stovetop, heat a nonstick pan to medium-high and add a drizzle of vegetable oil. Cook sliced scallions (or red onion) and diced garlic to the pan. This is a good time to add vegetables like asparagus, broccoli, etc. When the greens are bright and cooked through, move them to a plate. Then cook seasoned shrimp for a couple of minutes, move to the plate when opaque. Add the soy sauce mixture and drained noodles to the pan, toss for just a minute, then toss in vegetable mixture. Quickly plate the pad thai and garnish with cilantro and/or chopped peanuts. 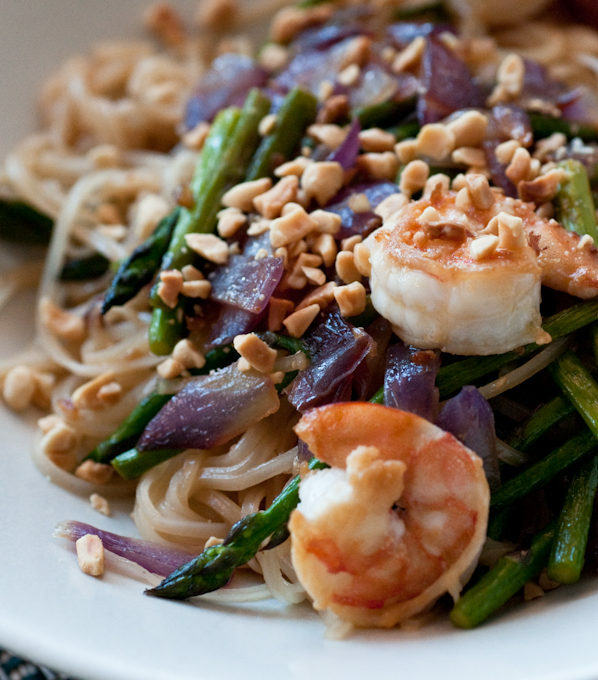 Making a restaurant favorite like pad thai at home allows more control and creativity. If sodium is a concern, opt for low sodium soy sauce, and balance the sodium with potassium-rich veggies like asparagus, broccoli, cabbage, or cucumber. The Meal Makeover Moms have a fantastic recipe for a pad thai style dish they call “Sweet and Nutty Thai Thing,” in which they add cubes of sweet potato for a nutritional boost. (Check out their cookbook for even more great recipes complete with nutritional info. How would you modify this recipe? Have any pad thai tips to share? "inspired by Everyday Food Magazine"
Looks like a fantastic and Easy recipe once you get the noodles down. Might have to give it a try this weekend. The recipe mentions seasoned shrimp. How did you season them? Give the recipe a try – bet you’ll love it! We seasoned the shrimp with a little soy sauce and oil, nothin’ fancy. Remember that the shrimp also get coated in the soy-sugar-lime mixture at the end. Love the title! And that photo is mouth-watering, too. I love pad thai, it’s actually the dish I always crave on my birthday (not sure why exactly), and no matter how yummy it is home made, it’s never the same as my favorite restaurants. But perhaps you are right, it will take many tries before I get it just right – I’ll try this version next time!